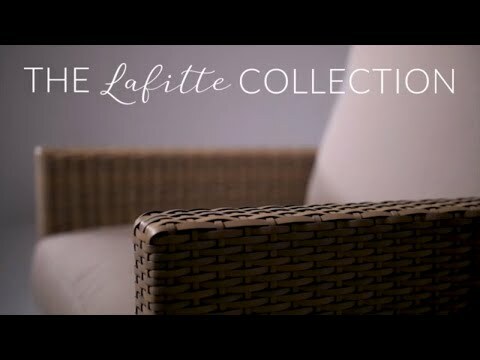 Bold, clean lines and contemporary comfort mark the Lafitte Collection by Lakeview Outdoor Designs. Hand-woven wicker in Tawny Ash is interlaced around extruded aluminum. The champagne powder coat is sealed with a clear finish to prolong the life of the furniture. High-performance Sunbrella Canvas Taupe fabric envelops wrapped foam, 5 inch thick cushions, providing fade-resistant, water-resistant and stylishly comfortable seating. The coffee and end tables feature slatted tops for an all-weather surface. Adjustable leveling feet allow ideal placement, providing improved stability on uneven outdoor surfaces. This Lafitte 4 person conversation set creates a compelling outdoor conversation area that will blend into any space. Dimensions (in inches): Loveseat: 54 5/16 W X 36 3/16 D X 35 H. Swivel Club Chair: 29 1/10 W X 36 1/5 D X 35 H. Seat Height: 11 5/8 Inches. Arm Height: 24 5/8 Inches. Coffee Table: 44 11/16 W X 23 5/8 D X 16 1/2 H. End Table: 18 7/10 W X 18 7/10 D X 18 7/10 H.
Table Size 44 11/16 X 23 5/8"
What is the weight of each piece in the set? Hi Jax, the coffee table weighs about 11 pounds, the swivel club chairs are around 50 pounds each, and the loveseat is about 68 pounds. 11 5/8" 11 5/8" 17" 17"
44 11/16 X 23 5/8" 44 11/16 X 23 5/8" 40 X 20" 43 X 24"
16 1/2" 16 1/2" 20" 16"